Generally wading boots should be sized one size over your street shoe size. 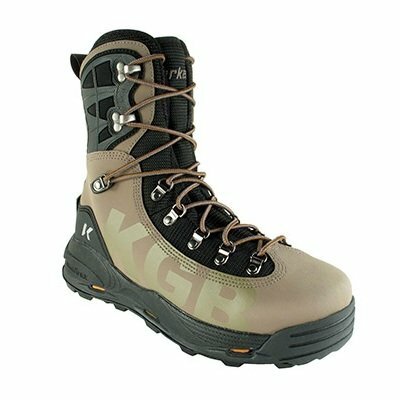 Korkers KGB wading boots can be purchased with two different sole combinations. Korkers Guide Boot incorporates the comfort and technical functionality previously found in Korkers wading boots, while enhancing stability and durability. Extra durable rubber, mesh and laces were added along with a TPU cage and Vibram Idro Grip outsoles, significantly raising the performance of this guide-level wading boot. We don't know all the features yet but we're sure its got some! Due to the high cost of shipping wading boots a $10.00 additional shipping charges will be added to every set of wading boots shipped outside the USA.